Tsada, Paphos - This charming 3 bedroom villa is located on a hilltop boasting breathtaking views of the Paphos coastline. The traditional Cypriot village of Tsada is nearby with it’s narrow streets, coffee shops, and tavernas, and one of the area’s superb 18 hole championship golf courses is a few minutes drive away. 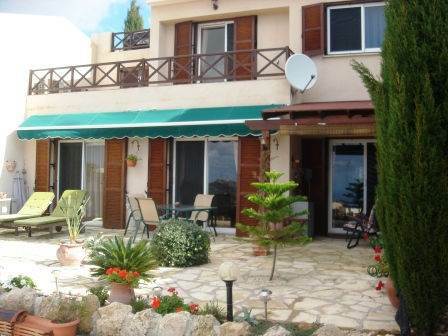 The property is built into the hillside and is in immaculate condition with good quality finishes. From the driveway, steps lead down to the stone walled entrance of the property. At this level the property features two double size bedrooms and a large separate bathroom. From the bedroom, patio doors lead on to a balcony with breathtaking views of the sea and mountains. A wooden staircase leads down to the spacious open-plan lounge, dining area, and nicely separated kitchen. The focal point of the lounge is the attractive fireplace with wood burner fire for those chilly winter nights. Patio doors lead from here and the dining area to the attractive garden terrace with magnificent views. Off the lounge is the large master bedroom with en-suite shower room, and again patio doors accessing the private garden. An electrically operated sun awning provides shade on the garden terrace when required. There is plenty of storage throughout the house, with large storage cupboards on both levels and fitted wardrobes in all bedrooms. Two minute’s walk away is the stunning communal swimming pool area with infinity pool and lots of space for sunbathing. From here you feel literary on top of the world and this is another vantage point to enjoy the views of the area. There is a small clubhouse for the use of residents. Part of an award winning project, this property is ideal as a permanent residence or holiday home. The villa has full title deeds.